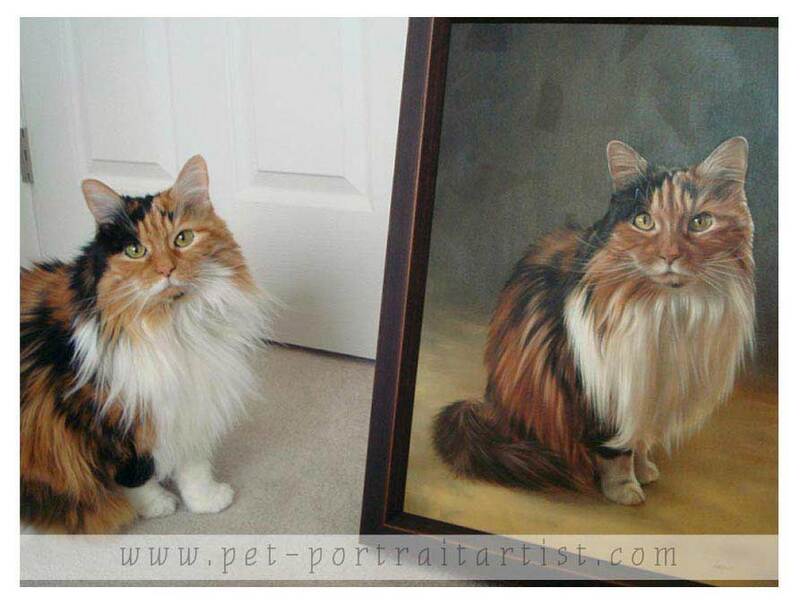 Nicole emailed us in 2010 and asked if we would paint her beautiful cat called Soda. Soda was painted in oils and framed by our local framer. You can see her portrait in the oil gallery. When the portrait arrived Nicole very kindly sent us a wonderful photo of Soda sitting next to her painting which I have added below along with some lovely emails that Nicole sent us. We thoroughly enjoyed working with Nicole and hope that she enjoys her portrait for many years to come. I just happened to check the blog and saw the first stages of Soda's portrait! The wait is worth it for the excitement you get from seeing your own portrait worked on. I find it very interesting to watch the process of the painting, how things are built up and changed, and the fact that it is my own cat is a bonus :) I have not been able to stop smiling since seeing the pictures and am excited to see even more as Nick progresses! 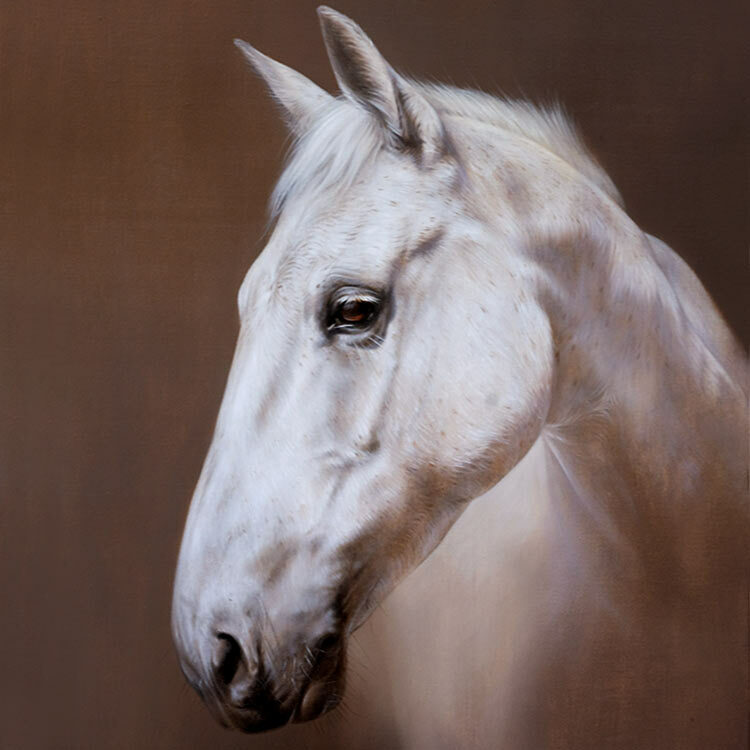 The portrait looks stunning, again I cannot stop smiling! It is amazing the amount of detail Nick was able to capture. Looking at the close up picture on the blog it seems as if he painted every single hair and she is quite a hairy lady so I'm sure that was a huge task to undertake! He captured her personality and likeness perfectly. 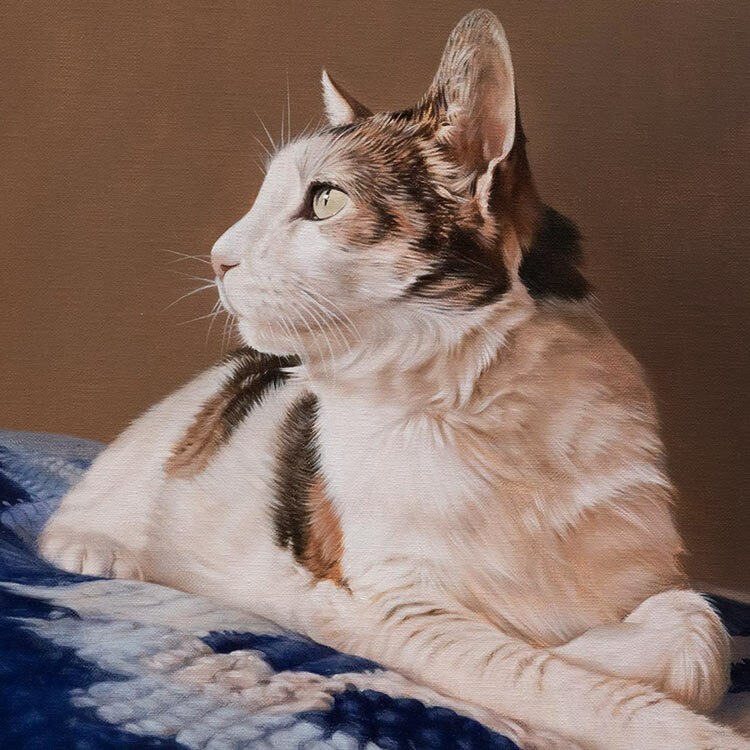 When I receive the painting I will be sure to take a picture of her sitting next to it, and I would be willing to bet it will look like a mirror image since that is her usual sitting pose! Please tell Nick he did an awesome job and I cannot thank him enough! Just mailing you to say the portrait arrived today in perfect shape. It looks so lovely in real life, very soft and a perfect representation of Soda. The colours are perfect and the detail is even more amazing to see in person. Thank you and Nick so much! I will try to get a picture of her next to the portrait in the next day or so. I am so sorry it has taken this long for me to get back to you! Some crazy days at work coupled with cloudy days providing no good natural light have kept me from getting a picture of Soda with the portrait until now. I have attached a photo of her next to the portrait and while she isn't in the exact same pose like I promised it is pretty close :) She is rather camera shy these days, I think because I have taken so many pictures of her, so it was hard to get her to sit still. I am glad it wasn't just me who was surprised at how quickly the portrait got here. It was a pleasant surprise as I wasn't expecting it so soon! Just want to thank you guys again. The portrait is so beautiful and will make me smile for years to come.